Ajo Kawir is one of the toughest fighters in the Javanese underworld, his fearlessness matched only by his unquenchable thirst for brawling. But the young thug is driven by a painful secret - he is impotent. When he finally meets his match in the shape of the fearsomely beautiful bodyguard Iteung, Ajo is left bruised, battered and overjoyed - he has fallen in love. 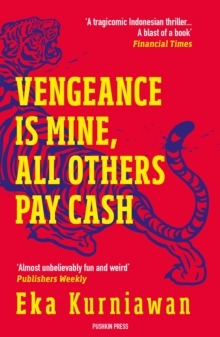 But will he ever be able to make Iteung happy?Vengeance is Mine, All Others Pay Cash is a gloriously pulpy tale of bloody fists, broken hearts and dueling Jakarta truckers, from the Man Booker International-longlisted author of Beauty is a Wound.